Chenoch Lieberman was born April 12, 1900 in Polotsk, Russia. His parents, Menachem Mendel Futerfas and Mariashe Bodana, came from a long line of Chassidim. As with so many other Eastern European Jewish families, harsh circumstances soon forced the family, with three children, to move, first to Dvinsk, now part of Latvia, and then to Kharkov in the Ukraine. Menachem Mendel's artistic impulse — he sketched and played the violin — was transmitted to his son Chenoch at an early age. But Chenoch was soon orphaned; his father died when Chenoch was only seven years old. Nevertheless, his father's love of music would appear repeatedly in the paintings of the later, mature artist. Young Chenoch was a compulsive sketcher and every surface was fair game for his drawings. He later recalled: "I would draw and sketch on books and discourses. I felt a 'soul-need' to draw. I was caught up, mainly, in drawing portraits and landscapes." The walls of his house were soon turned into murals, and even the young boy's prayer books were not safe from the lad's busy pen. At the age of twelve, Chenoch was sent to the Yeshiva in Lubavitch in White Russia, where he studied at the home of Rabbi Shmuel Gronem Esterman, a noted thinker and teacher in the community. By 1920, Chenoch was studying art in Moscow and learning the business skills he would need for his family's textile business. Chenoch soon started a family of his own: in 1925 he married Bryna Friedman, and four years later he was the father of two daughters. A turning point occurred in 1927. Lieberman had been bedridden for several months with an ulcer when he was visited by Innocento Zhukov. Zhukov, a well-known sculptor and disciple of the great Rodin, had seen Lieberman's work and wanted to submit one of his paintings to a national art competition. He had his eye on a small Lieberman painting depicting ice skaters on a rink. Lieberman's painting won first prize and a six-year scholarship for Lieberman to the acclaimed Moscow Academy of Art. Perhaps more importantly, this was the first confirmation for Lieberman that he was a serious artist. He devoted himself to his studies with renewed enthusiasm, surging through his course requirements at the Academy in half the usual time. The final requisite for his diploma necessitated spending time in the field, and Lieberman decided to travel to Birobidjan, Siberia, 6,000 miles east of Moscow. A year earlier, in 1928, under Stalin's edict, the remote area had become the official "new homeland" for Soviet Jews who would now have their own territory — as did such other ethnic groups in the Soviet Union as the Armenians, the Uzbeks, the Azarbaijanis and the Kazakhs. Bordered on the South by Mongolia and on the North by the Burreya and Khingh mountains, the wilderness of Birobidjan presented its own unique, pristine beauty. It was in this harsh but colorful environment that Chenoch, not yet thirty, began the chronicle of his people, the Jews of Eastern Europe. Artist at the Table by Checnoch Lieberman. Color pencil, 1972. In 1939, when he was nearly forty years old, Lieberman was forced to leave his family and join the Red Army's defense against the advancing Nazis. Twice he was wounded in combat, the second time in 1943, in the decisive battle of Stalingrad. Chenoch Lieberman came home to horror. His entire family - his wife and his daughters, Bluma and Leah - had gone to live with his in-laws in the town of Brayan. There, unprotected from the German onslaught, they had been rounded up by the Nazis, forced to dig their own graves and murdered. Devastated, Lieberman didn't know where to turn. His own life now in mortal danger, he, along with many others of the Lubavitcher community, sought refuge in Samarkand, the ancient city in Soviet Asia. Immediately after the war, the Soviet Union issued a prohibition against any Soviet nationals leaving the country. As a means to escape this prison, Chenoch dropped his family name, Futerfas, and adopted the more Polish sounding name, Lieberman. This name would help allow him to "return" to Poland, posing as a displaced Pole. Together with his mother, sisters, younger brother Mendel and Mendel's wife, Chenoch Lieberman made his way to the border. Though the rest of the party made it safely across, Mendel was caught and imprisoned by Stalin's secret police for helping Russians escape the country. He spent the next fifteen years in Soviet work camps. Poland was a temporary and unpleasant stop for the family; the trek continued westward. 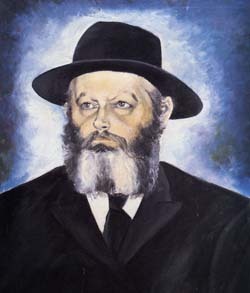 Chenoch made his way to Paris and became part of its growing Lubavitcher community, while his family went on to England. The spiritual leader of Lubavitch, Rabbi Joseph Isaac Schneerson, had settled in New York, and Chenoch Lieberman, his life shattered, sought the Rebbe's counsel about the one thing which still had meaning for him: reconciling his art with his religion. The Rebbe understood precisely Lieberman's needs and potential: Lieberman was an artist, and must recreate the world as he saw it. The artist is driven to imbue the world with his own unique sensitivity and perspective - this was Chenoch Lieberman's calling. The Rebbe explained that for the true Chassid, all aspects of life must be brought together in a larger harmony. The means of serving and understanding G‑d are varied, and they include the way of the artist. Any conflict Lieberman felt between his artistic inclinations and his Chassidic wav of life was thus resolved, and he became consumed by painting. Lieberman reached down into his own deep spiritual resources and turned to his work with a renewed vision and enthusiasm. Paris was the ideal city to nourish his artistic inspiration, and Lieberman's painting flourished. While Lieberman was in London, the Lubavitcher Rebbe, Rabbi Joseph Isaac Schneerson, passed away. In his mourning, Lieberman sketched "The Histalkus" (The Passing), one of his most powerful pencil drawings. The picture portrays a desolate wilderness with bare, twisted trees, and, as far as the eye can see, black-hatted Chassidim sitting on the ground, their hands held to their heads in grief. 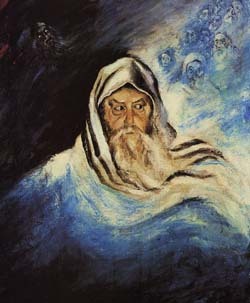 In the sky looms the face of the previous Rebbe, and behind him, the shadowy faces of deceased spiritual leaders welcoming the new soul into heaven. But the burden of history and personal tragedies continued to weigh heavily on Lieberman. He questioned again whether painting was a proper vocation for him, but once again he turned to his spiritual guide, the Lubavitcher Rebbe. The new Rebbe, Rabbi Menachem Mendel Schneerson, son in-law of Joseph Isaac Schneerson, also urged Lieberman not to abandon his talent, but to use it in the service of G‑d and humanity. 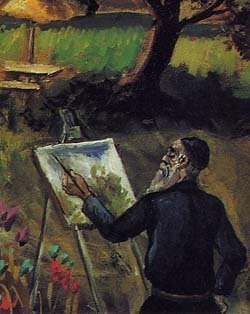 In a letter to Lieberman, Rabbi Schneerson captured the essential calling of the artist. Click here to read the letter. Lieberman did not remain in London for long. He soon moved to the United States and the growing Chassidic community of Crown Heights in Brooklyn, centered around the Lubavitcher Rebbe. Chenoch Lieberman derived great comfort from the religious understanding that Chassidism provided. Now living in physical proximity to the Rebbe, he flourished even more. Here he was, an artist occupying an honored position behind the Rebbe at prayers, celebrations and lectures. Chenoch soon became an important figure in the life of Lubavitch Brooklyn. "Let me tell you a story," Chenoch recalled, explaining his unusual career. "One day, many years ago, I came to Rabbi Menachem Mendel Schneerson, the Lubavitcher Rebbe. "How is your art coming along?" he asked. "I want to hold an exhibition," I answered. "Yes, yes, of course," said the Rebbe. "You should. Each person on this earth is allotted a task. You have a talent... use it. Use it to encourage Jews to return to their Judaism. True, in the old days, painting was not considered an acceptable way to achieve this aim. Today it is. It is your way" And so it was. Painting with a renewed intensity, Lieberman exhibited in galleries and Chassidic communities around the world, from New York to Australia. Lieberman's Chassidic life became increasingly intertwined with his artistic life. He once asked his nephew: "Do you want to know what an artist is? I'll tell you. You know I sit behind the Rebbe at the "fabrengen" (Chassidic gatherings centering on scholarly talks by the Rebbe, punctuated by heartfelt communal singing). By the time the Rebbe has begun his second talk, I have entirely forgotten what he just spoke about in the first talk But I remember a pattern of light and shade underneath the Rebbe's chair for forty years." Chenoch Lieberman fused his Chassidism and painting into a continuous intense life activity. His attachment to Lubavitch permeated his life. 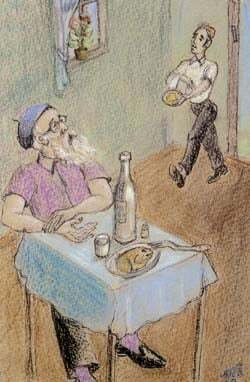 An unrelenting joie de vivre sustained and anchored a life beset with terrible personal tragedy and dislocation and Lieberman continued sketching even from his deathbed, sending some very personal, poignant pieces as a present to his Rebbe. After a prolonged stomach ailment, he passed away on March 15, 1976. Excerpts from an article by Joshua Dubrovsky translated and edited by Shmuel Klatzkin and Felicia Herman, assistant to the director of Yeshiva University Museum. Reprinted with the permission of the Chassidic Art Institute, Brooklyn, NY.